Hi everyone! I just wanted to tell you that I have finished my book trailer for my Daughters of the Dagger series and am excited to share it with you. Click the following series title to watch it. 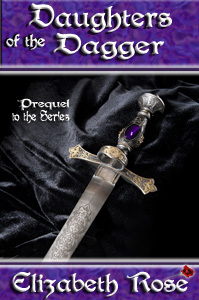 Also, don’t forget, the Prequel book for the series is FREE! Click the icons to pick up your copy today. Be sure to stop by my website to see my Book Trailer Video page. Eventually, I will have one for each of my books. The third and final book in my MadMan MacKeefe series, Ian, will be released sometime in the next few months, so please keep watch. I will post the new cover soon. And if you’ve missed the announcement about my new book, Aidan – Book 2 in the series, you can now read an excerpt on my website. This entry was posted in Medieval Romance, Scottish romance, Uncategorized and tagged elizabeth rose novels, Highland Romance, Madman MacKeefe series, medieval romance, Scottish romance by Lizrosek. Bookmark the permalink.